Not all of your customers may be worth keeping but for most bookkeepers and accountants, it’s important that you can keep most of them for as long as possible. How do you do that in an environment where many of your competitors are competing aggressively on price? They may be off-shoring the work, they may be using unqualified staff to do it. Either way, especially with increasing automation in the bookkeeping industry, there is downward pressure on your income. One response is to clearly differentiate yourself from your competitors and provide a service that can’t be easily replaced. This could be specialising in a particular industry – becoming the expert, for example, in all the systems that hairdressers need, or motor mechanics or plumbers. Industry knowledge will build your reputation and people will (eventually) spread the word. If your knowledge and experience is more general, there are still plenty of options. One is to build on the accounting information you gather and produce for your clients and tailor a set of reports just for them. Deliver it every month, follow up with a phone call to discuss the content, and you’ll be giving them something that can’t be outsourced to India or the Philippines. And it doesn’t need to take a lot of time or effort on your part to provide this service. Using Calxa, you can connect to their accounting data (which you know is up to date and reconciled), create a bundle of reports and then automate the delivery of that bundle to yourself and the client each month. Start with one of the Report Bundle Kits and an auto-budget to get up and running quickly but then talk with your client about which reports work for them and which are less useful. Some prefer charts, some like to see the numbers but it’s easy to add and remove reports from your initial bundle to tailor it to exactly what your client needs. You want your client to think of you every time they get their reports in their inbox. The simplest way to do this is to add a cover page to the bundle. You can put your logo front and centre but also include theirs to personalise it. Then copy that cover page from one bundle to another. With Calxa Premier, you can go one step further and put your logo on each report using the Report Designer – and even change the colours to match your brand. With the more common reports we’ve implemented styles to make that process easier – and we’re rolling those out to the other templates week by week. Once you’ve sent the reports to your client, follow up with a phone call (or a visit if that’s your style). Look at the reports before the meeting and find 3 key questions to ask. Look at what’s going well (either compared to budget or to last year) and what’s going badly. Your questions should prompt your client to think about those points. What can they do to amplify the good things? Are they sustainable? Were they expecting the problems? Were they aware of them? Do they have ideas on how to mitigate them? Ideally, you’ll get your client to agree on some steps to take over the next month to mitigate the problems and build on the successes. Document those in a follow-up email. You may need to make changes too – it could be adjustments to the budget to reflect a changing environment or it could be an additional report to provide more detail on a problem area. Make sure you keep to your commitments and it will be easier to ask the client next month if they’ve kept to theirs. 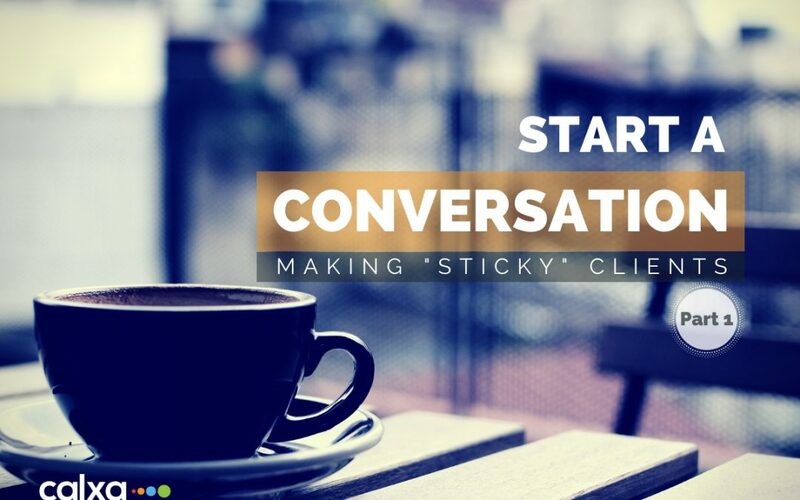 You’ll get to know your clients and their businesses better through these conversations. You’ll build up a history that will help you ask better questions as time goes on. Your client will value the time you spend together (and it doesn’t have to be a lot of time – it could be anything from 10 minutes to an hour). There should be an increase in the performance of the business over time. Not all problems can be fixed immediately but if your client is making small improvements every month, they’ll be fixed eventually. And you’ll get the credit for it. Many professionals shy away from an “advisory” role as they don’t feel they have the answers for the client. Change your perspective and think of yourself as the guide, the mentor, the coach and practice asking the right questions. Your clients will be smart enough to come up with the right answers. If you missed Part 1 of this series then catch up by reading the blog post here. Then continue on to read Part 3 which is about “The Sticky Action“.